This is a sponsored post written by me on behalf of Asurion. However, every detail in this post is true. Some names have been changed to protect the innocent…. Well, I went crazy for about an hour. See, the day started out like any other vacation day with some time in the sun, frolicking (okay, frolicking may be pushing it) in the ocean, and building sand castles. Later we decided to go shopping at a local outlet mall. Mama needed some shoes — no I really didn’t NEED shoes, but I have an addiction that needed fed. So off we went shopping. About half way through walking the outlet stores we got something to drink and sat down on a bench to refuel for the second half of our shopping extravaganza. After a few minutes of rest and shopping bags in hand, off we went. My husband and son went in another direction since they were not into looking at shoes and other “girly” stuff. I perused a couple of shops and after leaving the third store I look in my handbag for my phone to call my husband. Where IS my iPhone? I find a bench and give my bag a thorough look. No iPhone. Ugh! How could this happen? I couldn’t call my husband to see where he was or tell him where I was, so I just walked back to a central area where at some point he would more than likely come by. Sigh. He finally shows up to a half-crazed woman. Hey, I’m not proud, but it is what it is… my iPhone is my life line. And I felt like I was sinking. I needed my phone. We backtracked everywhere we had been since I last remember having my phone. I asked every sales clerk in every store I had been in if they’d seen it, to no avail. We located the outlet office and discovered that a security guard found it on a bench (the one we stopped to refuel at) and brought it to the office. Bless you dear security officer! It is times like these when I could have used Asurion Mobile Protection. It sure would have given me a little peace of mind. 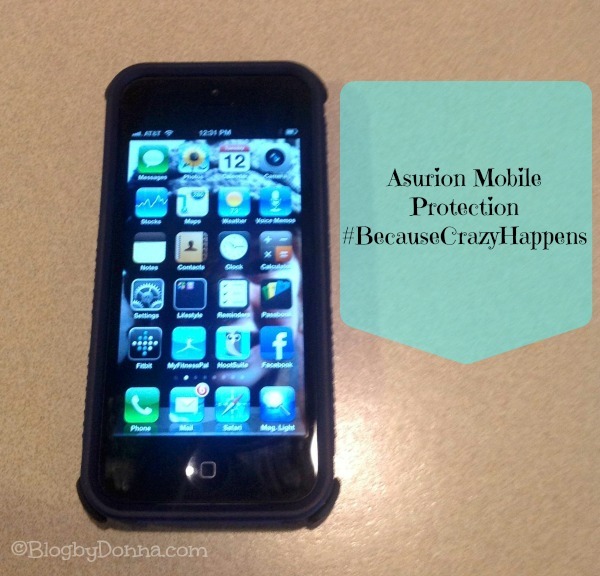 Since Asurion Mobile Protection offers unique iPhone protection that covers things like drops (and if you know me and/or are a frequent reader, you know that happens a LOT, too), spills, theft, AND lost iPhones. Check out this infographic on cellphone theft, it’s staggering. Although I’m generally pretty good about keeping up with my phone and trying not to drop it, accidents happen. They just do. So it pays to have a mobile protection plan like Asurion. For more information, visit http://on.fb.me/XB9MF0. This is a sponsored post written by me on behalf of Asurion. My daughter has been through more phones due to breakage than I care to admit! Asurion is totally necessary in our house! LOL! My husband needs this. He is so bad at ruining or losing cell phones. I’m so glad the guard took it & didn’t just leave it for someone to steal! We actually almost always have the insurance on our phones. We filed a claim with Asurion once and had no issues. I had heard that Apple and google are coming up with something called kill switch which can remove everything from the device and make it unusable for the thief if something like this comes up it will be a great asset. I have felt like this before… but when I lost my car keys! I went crazy until I found them! It turned out that my daughter who was about 4 at the time stuck them in her backpack and took them to preschool! yes I use my cell for almost everything and you’re right, I’d be half crazed as well. I need to check into some sort of insurance/security especially here at the holiday time when life gets really crazy. That’s great. I do have an unlimited plan for my iPhone, but no insurance. I always worry about dropping it. Thanks for sharing about this. This story panics me, I don’t often carry a purse, so my phone is just right in my hand and while I’m walking/texting/surfing I realize I can get it nabbed right out of my hands! I’m going to look into this, thanks! I am glad that you found your phone. I too depend on my phone and wish that I had insurance on my phone. looks like a VERY useful app!!! I would SO go crazy, too. My phone is glued to my side and I panic when I can’t find it! I’d be lost without my cell phone too. We have 5 lines and they’re all covered. I’ve lost my phone twice and they handled my claim quick and with no hassle. Love the infographic…very informative! Thanks for sharing it with us Donna. Happy Friday lady! I would gone crazy too! My iPhone is my life, which is a little sad. But let’s face it – we use it for EVERYTHING! I’m glad your story had a happy ending and you got your phone back. I haven’t lost a phone … yet. Knock on wood. Have a great weekend, Donna! I don’t know what I’d do without my phone either! I will have to look into protecting it more. I know as my kids get older, it’s definitely something we will need. At only 2, my son has managed to break 2 iPads. I should probably stop letting him play with fragile things now that I think about it…. Good to hear you found your cell phone. We rarely use ours but just recently bought a new one and immediately added the insurance coverage to cover any lost broken cell phones. We felt the insurance was worth it after paying $750 for the phone. Since I bought my first phone at 17 I had insurance on it. I know how I am with my stuff and having insurance on your phone just makes sense! Especially if you lose it. I luckily never have had to replace a phone because it was lost but I’ve had to replace it for other reasons! Don’t feel bad we all feel naked without our phones. Like the photo above shows, we use it for everything! I agree with you! I’d be insane … and lost without my iPhone! I’ve left it behind at home from time to time, and I feel so “lost” when I do that. My son put Find My Phone app on each of our phones. Handy when misplaced, annoying when he sets it off just to “find Mom”! I hear that someday our phones will be stick-on to our arms. A good thing?